The visual for the Ctrl standout is a fantastical story of empowerment. SZA has released a new video for "Supermodel," a standout track from her Ctrl album. In the Nabil-directed video, a group of fairies lead the TDE singer down a wooded path as they sprinkle fairy dust on her. 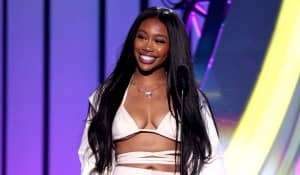 SZA's love interest appears on the path ahead, seemingly taunting her, and she ends up on a school playground, shooting fireworks out of her fingers as the man tries to avoid being hit and a group of kids cheer her on. "Supermodel" was featured on the second episode of the second season of Issa Rae's Insecure on Sunday night. The video is an Apple Music exclusive and is available to watch here.